Sarah McLachlan's CDs were some of my favorites in college including Fumbling Towards Ecstasy and Surfacing. I can't tell you how many times I must have listened to those albums, and I still pull them out every so often. Her songs just flow with thoughtful lyrics and hauntingly beautiful melodies. This week McLachlan released a new album, titled Laws Of Illusion . It's been seven years since she released all new material, and I am delighted to have the chance to review it thanks to One2One Network. 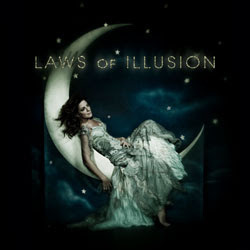 The image on the cover of Laws of Illusion shows the singer happily over the moon, but once you start to listen to the lyrics closely it becomes quickly apparent that the image is an illusion and the songs are anything but happy. I haven't payed much attention to McLachlan's personal life, and had no idea that she had split up with her husband a couple years ago. Many of the emotion filled songs on this album deal with the pain, the frustration and the loneliness as she comes to term with this heartbreaking change in her life and the hope for tomorrow. I'll admit that at first I was actually kind of disappointed in the overall theme of the album, mostly because I felt that I couldn't connect with the songs. I'm still happily living the fairy tale. But, McLachlan is truly an artist, a true artist paints what she feels, and there is no denying the paintings in this album are works of art and that her voice and familiar style reside within each and every one of these songs. The album starts off with a realization of love gone wrong in "Awakenings." "Illusions of Bliss" is one of my favorites and just flows with pure sounds, a classic McLachlan melody. "Forgiveness" sounds somewhat along the lines of "Adia" with lyrics "Through the year we'd had it all / The midnight whispers, the midday calls / This house of cards it had to fall / You ask for forgivness, you're asking too much. " The bouncy and upbeat "Loving You is Easy" is the album’s first single and is another one of my favorites. The harmonies blend beautifully in the hopeful, final song "Bring on the Wonder." The end of June, McLachlan begins her tour in the returning Lilith Fair festival, a festival she co-founded and toured in between 1997 through 1999. For a list of all the participating artists and tour dates, see the Lilith Fair website.